Wabi-Sabi: a Japanese aesthetic that is sometimes described as one of beauty that is "imperfect, impermanent, and incomplete"
As you can see in the pictures, these came out with cracked and unpretty tops. 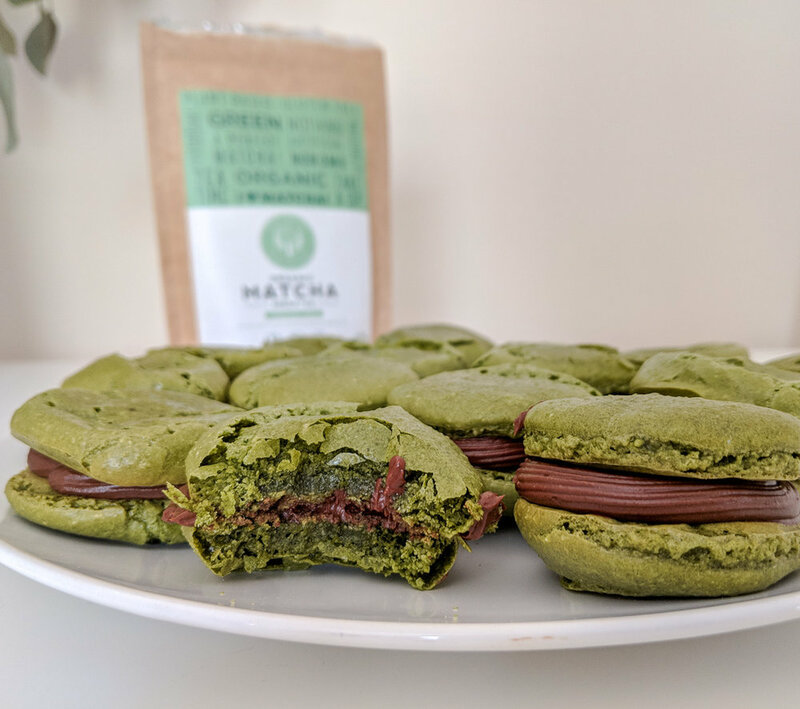 I followed the same instructions of my recipe for chocolate macarons - but matcha does not act the same as cocoa powder, so they came out a little funny looking. I usually would try this a couple more times to get that "perfect" looking macaron - but I decided to share them as is instead. They tasted great, so WHO CARES what they look like! 1. Whip the egg whites and cream of tartar on high speed in a stand mixer or with a handheld mixer until foamy. Still on high power, slowly add in the sugar. Continue to whip until stiff peaks form - sometimes can take up to 10 minutes. 2. Sift the powdered sugar, almond flour, and matcha powder through a sieve into a large bowl to remove any clumps. 3. Gently combine the dry ingredients with the egg whites - I do this a little at a time, in about 4 batches, stirring with a silicon spatula. Move the spatula around in a figure-8. You don't want to over stir! The egg whites are gentle and treat them as so. 4. Once the two are completely incorporated, continue to move in the figure-8 motion until the mixture is nice and smooth and ribbon-y. 5. Transfer mixture to a piping bag or a large ziplock bag with a tiny corner cut out. 6. Pipe out about 1-inch circles of mixture onto a parchment paper lined baking sheet. Once they're all piped out, tap the sheet against the counter a couple times to get out any bubbles. Allow shells to rest for about 30 minutes - or until you can touch the tops and they do not stick to your fingers. 7. Preheat the oven to 275 F.
8. While the shells are resting and the oven is preheating, prepare your ganache. Bring the 1 cup of coconut milk to a boil. Add the chocolate chips to a heat safe bowl and pour the hot coconut milk over them. Whisk together until fully incorporated. Place in the fridge. 9. Bake the shells for about 20 minutes - or until the classic feet have grown and they come off of the parchment paper with ease. Mine had a little trouble in this department... but it's okay! 10. Once the ganache has hardened and the shells have cooled, pipe the chocolate ganache onto half of the shells and top each with another shell! Enjoy!